Good news! Our partner organization Foundation Harena has been able to raise funds to continue the construction of our Nursery School Project in Paita, Peru. Phase II will be a dividable 80 m2 multifunctional classroom. The design was made by MO STUDIO as a volunteer gift for BHD. The highlighted part of the photo also includes phase III of the project, including two more classrooms, a green area with playground and a home for the responsible nuns who are running the nursery. Funds for phase III are still to be raised. Please click here if you would like to help. Thank you. We have just returned from a very successful trip to Teso, Uganda to see for ourselves the construction of Phase One of the Shalom International School project. The trip was sponsored by our client organisation TESS. Construction is progressing well in the capable hands of Eng. Joseph Odeke and his building team and the volunteer engineers from EFOD. Phase One is approximately 340m2 in size. During the trip we received offers from local specialists to provide bio-gas and solar power installations that are now under consideration. BHD volunteer, Rev. Charles Okunya, has been photographing the project during construction and sending regular progress reports back to our office in Spain. As the project moves into the next phase we have decided to engage a local architect to oversee the works and check that everything is carried out according to plan. This is one of the many reasons for our current fundraising drive, the "1000 Members Campaign". 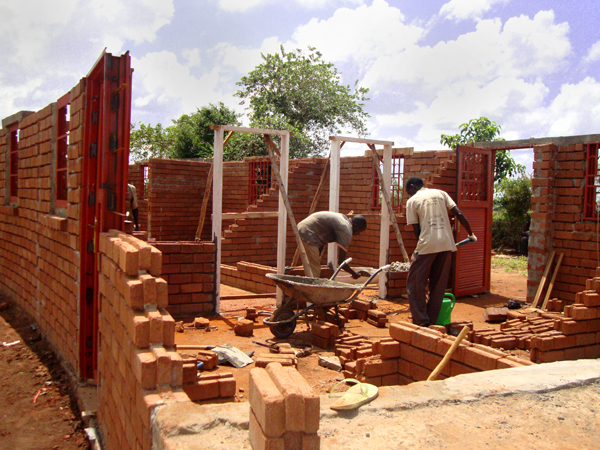 Phase Two will be a masonry workshop as part of the project's vocational education department. The building will be approximately 300m2. 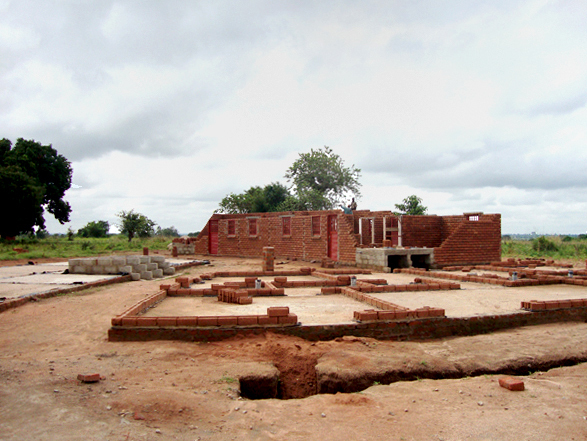 Stages of construction; foundation, floor plate and in the background the curved walls rising up. EFOD Engineers together with local builders are clearing the site. To go to the project site please click here. BHD, in its role as project supervisor for the Shalom International School, is pleased to report very good progress on the construction of the first phase. We are very grateful for the wonderful work being carried out by our collaborators, EFOD Engineers, both on site and back in the UK. BHD is equally grateful to the professional work of our local builder, Joseph Odeke, and his work force. Of course we would also like to thank the charity TESS and their devoted team for their input and guidance. TESS is both initiator and promoter of this beautiful project. Thank you to everyone! To follow the construction works please have a look at our Shalom project Blog. Local officials, clergy, politicians, neighbours and people of the whole region of Tesso, TESS representatives, representatives of the EFOD engineers from the UK and the BHD president Marion Regitko were all taking part at the very special and emotional event of the Ground breaking of the Shalom International School Project for Lifelong Learning. Children with their parents joining the opening event of the nursery. In October BHD President Marion Regitko has visited the Nursery in Paita. Her task was the review the construction works, project costs and to access the project management that was undertaken by a team of local charities and the Malaga based charity Foundation Harena. "I have been invited by the Charity TESS to go to Uganda and visit the site of the Shalom International School Project. This is located next to a small village called Kapiri in Teso province of Uganda. My mission was to get to know the terrain surrounding the site and to meet local team members of TESS. However the most important goal was to find local professionals to carry out the construction works. To do this I met with several local architects, engineers, building technology specialists, etc. I visited example building projects in the region using sustainable building technology such as Interlocking Stabilized Soil Block (ISSB) construction, compost toilets, solar energy, rainwater harvesting etc. My visit also included a presentation of the design to about 1000 members of the local community of Kapiri". Gordon Haslett, photographer and vice- president of BHD, joined me on my trip to Uganda to take photographs connected to the project and the projects surroundings. To view some of his photographs, please visit http://gordonhaslett.blogspot.com. We have signed a collaboration agreement with the Charity T.E.S.S. to support their project for a lifelong learning school located in the district of Teso in Uganda. The project is located in a settlement called 'Juan Valer Sandoval'. The settlement overlooks the coastal town of Paita in Northern Peru situated close to the equator. The area is a dry, sandy plane with year-round high temperatures and very little rainfall. Design for a nursery in Peru by BHD Volunteers MO STUDIO and Daniela Stefan. By making a donation today you are supporting the construction of inspiring and sustainable buildings that will improve lives. Click here to find out how to make a donation. Buildings for Human Development relies upon the support of its members, other organisations, companies and the general public. It is through the support of our donors and volunteers that we can achieve our goals and make a meaningful impact for communities in need. Membership means that you are a financial supporter of BHD and the work that we are doing in communities around the world. Click here to find out how to become a member.